Morris Gleitzman is a prolific Australian children’s author, who has penned such classics as Two Weeks With The Queen, Toad Rage, the Once/Then/After/Now quartet, and a whole lot more. While most of his books are strictly tongue-in-cheek fun, others (like the quartet mentioned above) provide younger readers with a fictional story based on references to real-life events (such as the Holocaust). 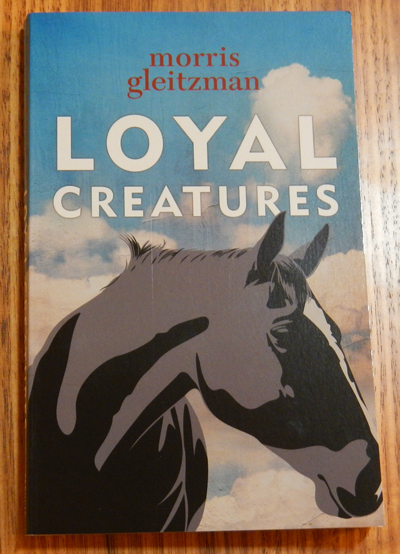 Gleitzman’s latest offering, Loyal Creatures, also uses historical events as a basis for the plotline, but this time, the focus is on the Australian Light Horse regiment of World War One. While writing a workshop script of War Horse for his friend- fellow author and creator of War Horse, Michael Morpurgo- Gleitzman learnt about the history of the Australian Light Horse, and the role that they played in the desert campaigns of Egypt and Palestine. Fascinated by the dedication and loyalty of the soldiers and their horses, he was inspired to expand his script, ending up with the novel Loyal Creatures. Unfortunately the circumstances towards the end of the novel are based on real-life events- rather than spend thousands of dollars and several months in quarantine, many in the military believed it was better to sell their undamaged horses to other countries such as India or Britain. Injured horses were shot, and their hides, tails and manes were sold to local traders. These wartime animal heroes were treated for their loyalty in the most inconceivable way possible, and their riders and former owners were powerless to do anything. Gleitzman’s portrayal of unequivocally Aussie boy Frank, his relationship with his horse and the horrors of war is both realistic and heartbreaking. Young readers interested in war stories and animals, or who enjoyed Morpurgo’s War Horse, will appreciate this novel. It was better these beautiful loyal horses' were shot, instead of being given to cruel M.E.